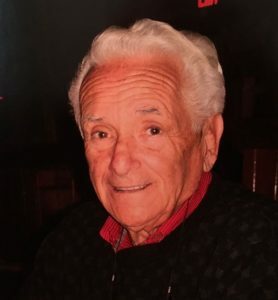 Mike Fine, one of the best bridge players in the area and a shining light for the RBA, passed away, January 21 at the age of 88. Mike started the EasyBridge! program in Richmond in 2001. These classes became Friendly Bridge, a terrifically successful program for beginning bridge players. He served as President of the RBA for many years and successfully guided the unit through difficult times. Born in Brooklyn, N.Y., Mike and his brother Gerry moved to Richmond in the 50’s, and ran Fine Brothers Supermarket. In the early 70’s he started a new venture, Fine Windshield Repair which he owned for 42 years before retiring last year. Over the years he found time to play in regional and local bridge tournaments, earning the distinction of Diamond Life Master with over 7,100 points. Only five active players have accumulated more points in the Richmond area. Mike was always eager to help up-and-coming players with tips and suggestions on bridge. He and his long-time partner, Dickie Hamilton were recognized at the October RBA Sectional on Dickie’s 95th birthday. They promptly recorded a 62% game. Not only will Mike be missed at The Bridge Center, but the RBA and the entire bridge community has suffered a tremendous loss. The ACBL Bridge Bulletin will publish an obituary for Mike in April.